A terrarium is a miniature world for plants. It is also called an ecosystem. The cool thing about an ecosystem is children can see evaporation, condensation, and precipitation taking place before them. It also helps them understand how important water is as a resource. How does a terrarium work? During the day a terrarium is in the sunlight. The sunlight heats the air inside the container. This warmth around the plants causes them to transpire. When the plants transpire, the container is filled with water vapor or a mist. Once the water vapor reaches the sides of the container, it turns into tiny drops of water and moves down the sides of the container and into the soil. Clean the container, rinse, and dry completely. Cover the bottom of the container with pea gravel for drainage. Use a ½ inch for small containers and 1-1/2 inch for large containers. Cover the pea gravel with moist potting soil mix. Fill the container one-third to one-half full. Make sure there is at least 2-3 inches of potting soil for the plants to grow into. Choose and add your plants. Arrange them anyway you would like. Create and have fun! In addition to plants, you might add little figurines, pebbles, or other tiny objects to the design. 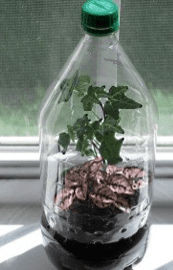 Place the terrarium in a windowsill or on a table near a window. Cover the opening with a lid or plastic. Watch your terrarium closely to make sure there are water droplets forming on the sides of the container. If little or no water collects, you may want to add water by misting it using a spray bottle. If a lot of water collects and you cannot see the plants, you may want to remove the top and let it dry out and evaporate. Trim plants once they start growing. Keep leaves from touching the sides since they will prevent the water droplets from working back down to the soil.